Do you suffer from sinus or chest congestion? Use this page to relieve your symptoms. We all get sick eventually, and we all get allergies eventually. Sinus and chest congestion are some of the inevitable symptoms of these two major problems in our lives. Whether it's springtime allergies causing your sinus congestion, or a bout of the flu causing your chest and esophagus congestion, acupressure can help alleviate your symptoms. Acupressure works by balancing the life energy that flows throughout the meridians of the body. This inner energy helps lead to the resolution of physical illnesses when it is allowed to flow freely. But it also can lead to the onset of illness when it is imbalanced or restricted from flowing properly. That's why learning and using an energetic healing art like acupressure is so important. It gives you the tools you need to personally balance your own energy system, and lead to the alleviation of symptoms and, sometimes, the complete healing of the illness or negative health condition that ails you. Let's take a look at some acupressure points that will help get rid of sinus and chest congestion in our bodies. 1. Kidney 27, found near the center of the top of the chest, in the hollow above the breastbone, below the collarbone. Use this acupressure point for alleviating chest congestion, especially that which is caused by allergies. It will also help alleviate many types of breathing difficulties, including asthma, coughing, and sore throats. 2. Stomach 36, on the front of the lower leg, four finger widths below the kneecap, slightly to the outside of the leg. Use this point to strengthen the entire body. This will help alleviate allergies that can cause congestion. 3. 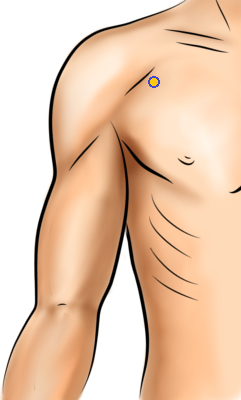 Lung 1, on the front of the chest/shoulder area, three finger widths below the collarbone. Use this Lung meridian point to improve the functioning of your lungs and airways. This point will help relieve asthma, chest congestion, and coughing. 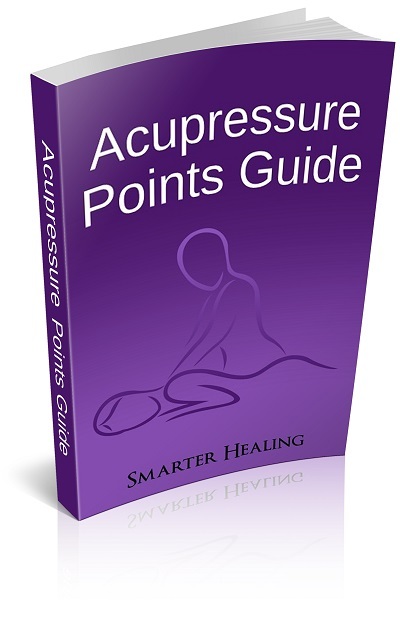 This pressure point also helps alleviate breathing difficulties of any kind. It also reduces tension in the chest, especially that which is caused by emotional distress. 4. Lung 9, on the back of the hand, in the groove of the wrist, below the thumb. Another Lung meridian point that will benefit your breathing. Use this to relieve lung problems such as congestion, coughing, and asthma. 5. Bladder 2, on the face, inside the groove of the eye socket, near the inner end of the eyebrow. This pressure point will help relieve colds, headaches, and tired eyes. It will also help relieve sinus congestion. 6. Stomach 3, on the face, to the side of the nose, at the bottom of the cheekbone, found straight down from the eye. 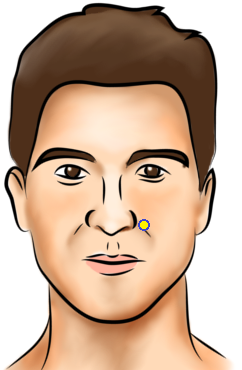 This facial acupressure point will help relieve congestion in the entire head. It will also help with a stuffy nose, and eye problems such as pressure in the eyes, eye fatigue, and burning sensations. 7. Large Intestine 20, on the cheek, just to the side of the nose. Use this acupressure point to relieve nasal congestion and sinus pain. It will also help reduce facial swelling and paralysis. 8. Large Intestine 4, on the back of the hand, in the space between the bones of the thumb and index finger. This pressure point on your hand will relieve symptoms of colds and flu, increasing constipation, headaches, and head congestion. 9. Gallbladder 20, on the back of the head, in the hollow below the skull, about an inch to the side of the spine. This point on the back of your head will relieve head congestion. It also helps reduce headache pain, arthritis pain, neck pain, and general irritability. 10. Governing Vessel 16, on the back of the head, in the center of the spine, in the hollow area below the skull. Use this powerful Governing Vessel meridian point to relieve your head congestion. It will also help reduce mental stress, headaches, stiffness in the neck, and redness of the eyes. 11. Governing Vessel 24.5 (between GV24 and GV25), on the front of the forehead, directly between the eyebrows. 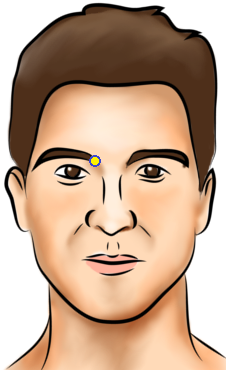 Known as the "third eye" point, this acupressure spot is not actually a formal acupuncture point. However, it is still used by healing practitioners for various purposes. In our case, using it with acupressure will help relieve head congestion, a stuffy nose, and headaches. 12. Bladder 10, on the back of the head, half an inch below the base of the skull, slightly to the side of the spine. This point on the back of your head will relieve head congestion and many other head problems, including hay fever, stiff neck, swollen eyes, and sore throat. It will also help reduce stress in general and emotional and energetic fatigue. 13. 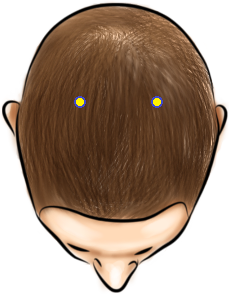 Bladder 7, on the top of the head, above the back of the ear, on thumb width down from the center of the head. 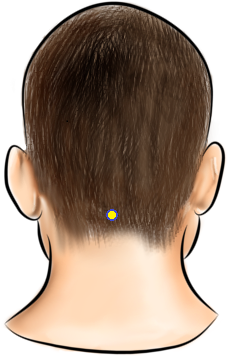 Use this pressure point on your skull to relieve head problems such as sinus and throat congestion, headaches, and stuffy nose. This point can also help strengthen your sense of smell. 14. Governing Vessel 20, on the top of the head, straight up from the back of the ear. This point on the crown of your head will help relieve sinus congestion and headaches. It will also help improve memory and concentration.